Summary (from Goodreads): A knife-sharp debut novel that leaves its mark. 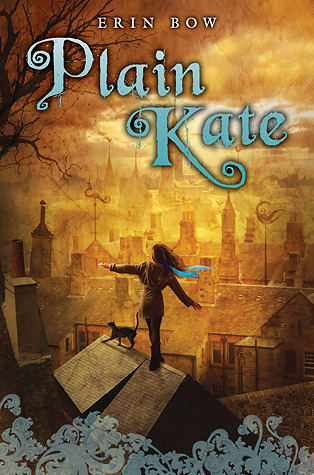 Plain Kate lives in a world of superstitions and curses, where a song can heal a wound and a shadow can work deep magic. When Kate's village falls on hard times - crops fail, and even Kate's father falls victim to a deadly fever - the townspeople look for someone to blame, and their eyes fall on Kate. Enter Linay, a stranger with a proposition: In exchange for her shadow, he'll give Kate the means to escape the town that seems set to burn her, and what's more, he'll grant her heart's wish. It's a chance for her to start over, to find a home, a family, a place to belong. But Kate soon realizes that she can't live shadowless forever -- and that Linay's designs are darker than she ever dreamed. My Summary: Kate - Plain Kate, as she's known to those in her small town - was carving before she could walk. Raised by her father, a talented woodcarver, Kate knew that she'd be able to develop her talents and apprentice under her father when the time came. But things never went as planned. Kate's father perished, leaving her alone and penniless in a town that despised her. With nowhere to go, Kate takes up residence in her fathers stall in the market square. She survives for years on nothing but her skill, undisturbed - until a mysterious stranger comes to town, offering her a wish in return for her shadow. My Thoughts: This book was everything I wanted it to be and more. Set in an unnamed country at a time when those suspected of witchcraft were still burned at the stake, Kate's story twists and turns in a way that keeps you glued to the pages. The hardships she faces make you wish you could reach into the book and help her - she was an innocent girl whose only crimes were trying to survive after the death of her father and practicing her art. I adored the characters. Taggle was, by far, the best talking cat I have ever had the pleasure to read about. Each had their own motivations and quirks, and despite their actions you could see they had good hearts. Final Thoughts: I definitely recommend this novel to anyone who enjoys paranormal YA and MG, and anyone who's looking for something unique and original.